The wheels are in motion for the inaugural gathering of Africa’s fittest at Carnival City's new Sun Park in October 2017. The 2017 African Championships – Africa's Fittest, set to be an annual competition, takes place on the 27th and 28th of October. The African Championships – Africa's Fittest provides a platform for athletes to compete for titles and prizes. Prize money of R40 000 has been allocated to the men’s as well as the ladies" categories. The men and ladies leaders after each heat will be awarded the African Champs Yellow Jersey. The African Championships – Africa's Fittest organisers chose the semi outdoor entertainment venue, which encompasses 3000 square metre arena, as it provides a perfect platform for uninterrupted WODs (Workout of the Day) while spectators can enjoy the outdoor beer garden and entertainment areas. 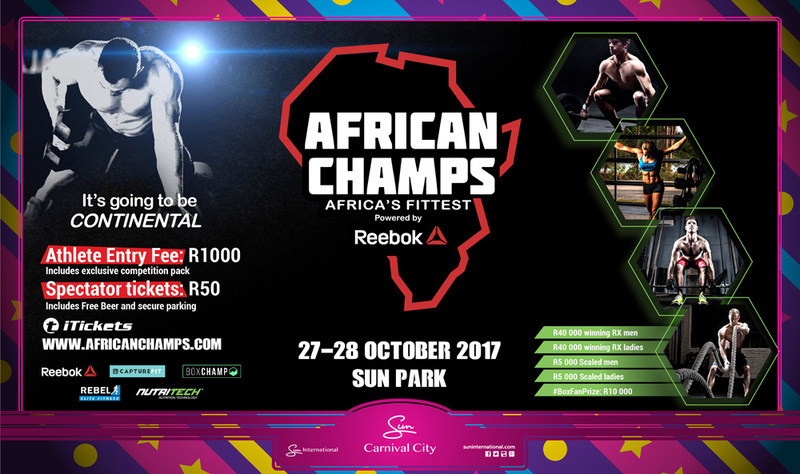 "Carnival City, which hosts a myriad of sporting and extreme sports events each year, is excited to announce that the first ever 2017 African Championships – Africa's Fittest will be staged at our Sun Park in October. The event is earmarked to be an annual fitness competition where male and female athletes will have the chance to compete against like-minded, fit individuals from across South Africa and the African continent," says Michelle Smith, the Marketing Manager at Carnival City. About 300 RX (elite athletes) athletes will fight for the individual title to be crowned Africa's fittest. The WODs for the RX athletes will be announced closer to the event date. In the spirit of growing the sport for the years to come 100 x BoxChamp Scaled athletes will battle it out on the first day of the competition (Friday, 27 October). Adding a special twist to the tournament, competitors will know the nature, duration, number, frequency or timing of the workouts they will be required to complete during the competition until shortly before each event begins. The constantly varied workouts are designed to test a competitor's general physical preparedness, including strength, speed, agility and endurance, through a combination of Olympic lifts, gymnastics movements, climbing ropes, powerlifting, running and more. Email your proof of payment to info@africanchamps.com.